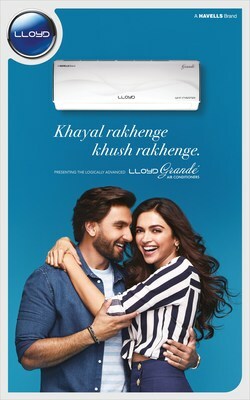 India's leading consumer durables brand, Lloyd, has signed Bollywood's biggest power couple and youth icons Deepika Padukone and Ranveer Singh as its brand ambassadors. This is the first time that India's most loved couple will share screen space for an ad and incidentally, this is also the first brand that they are jointly endorsing post their marriage. This is the biggest coup achieved in the ad world in the recent past and leading Entertainment marketing agency, Go Fish Entertainment, has managed this feat with elan. Lloyd has been at the forefront of the consumer durables industry over the years with products that are relevant to the evolving lifestyle needs of the Indian consumer and are backed by innovative technologies that are tailor made for them. Lloyd understands the need of today's young and discerning consumers and its products are synonymous with powerful performance and impeccable style. Keeping these brand values as their core campaign communication, Lloyd felt that there couldn't be a better choice than Deepika and Ranveer as endorsers representing the brand. The new campaign idea, 'Khayal Rakhenge, Khush Rakhenge' reveals the beautiful chemistry of the couple in a playful, extremely endearing and honest manner. The campaign is a slice of life take on their unseen chemistry as husband and wife, with Lloyd products playing a crucial role in how they take care of each other and show their love in the little ways that matter the most. Given their extensive youth appeal and massive fan-following across the country, Deepika and Ranveer are the perfect choice for Lloyd to strike a chord with new age consumers and also expand the brand affinity across markets. With the brand constantly looking to evolve and change further, Go Fish Entertainment was tasked with identifying and bringing on board brand ambassadors that resonate with the brand's values and is synonymous with impactful performances and impeccable style to showcase Lloyd's new and innovative range of products. The choice was obvious as Lloyd and Go Fish Entertainment felt that signing the combined star power of two of the biggest Indian celebrities, who are also one of the country's most loved couple, as endorsers will make an unforgettable impact in the minds of new age consumers across India.